Listening to Nelly Miricioiu was pure delight. I didn't expect otherwise. I was so glad that she came back to Bucharest. 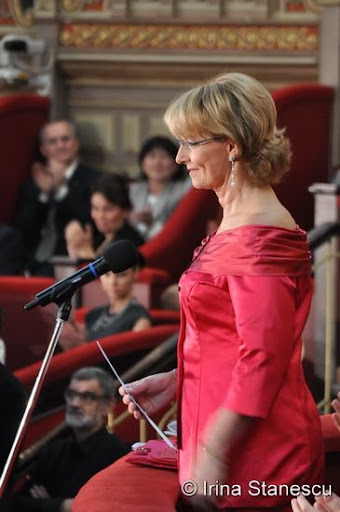 She was invited to take part in a charity concert for Princess Margareta Fund. With the money collected many talented young artists will be supported. The Athenaeum is the perfect place for this kind of event. It gives you a certain feeling... of royalty. There were a lot of people there, smartly dressed. It was a special event. HRH Princess Margareta and HRH Prince Radu Duda attended. Mrs Miricioiu offered one hour of intense emotions, from Sola, perduta, abandonata (Manon Lescaut) to the powerful Madre, pietosa vergine (Forta del destino) and the duet from Lucia di Lammermoor with baritone Yuriy Tsiple. She delivers the whole package: voice, feelings, acting.. she's a complete artist. The two artists were joined on stage by the Romanian Youth Orchestra and the conductor, Mr Horia Andreescu. Another night to remember added on the shelf of my cultural library.